Shadowgate original NES Nintendo Game cartridge only - Cleaned Tested and Guaranteed to Work! I had this game as a kid. One of my favorites. Love this game. A classic adventure title that holds up well today. Shadowgate is a very unique game. It's what one would call "brutally difficult" without a walkthrough. 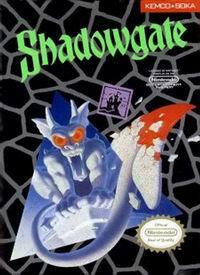 The game consists of figuring out how to advance through the castle Shadowgate by picking up items and interacting with them and the environment in many ways, and I gotta say, it's an incredible game. There might be a few moments that are too cryptic and difficult, but the game as a whole is just fantastic. The music is great, the atmosphere is chilling (yes, in a NES game), and it can actually be pretty scary at times. There are also brief moments of humour with some ridiculous death scenes. 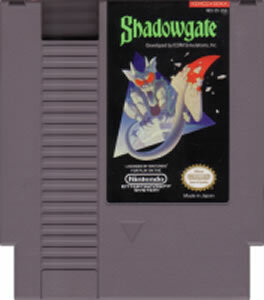 All in all, Shadowgate is a classic worth playing. I owned and played this game years ago, and I liked it so much, that I ordered one recently from Lukie Games so that I could play it again. I've forgotten how to solve the puzzles, so it's like having a new game to enjoy, all over again. 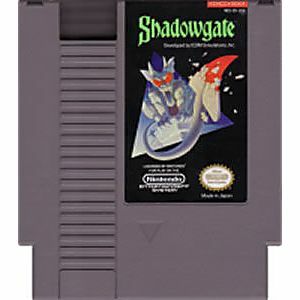 Faced with the task of confronting the evil Warlock you venture into castle Shadowgate which is built entirely of puzzles. You go room to room picking up items, figuring out where the items go and how the items are used. Some items are used to get from one room to another, some are used against monsters that block you from proceeding and some are used in conjunction with other items in your inventory. There is a lot of backtracking then jumping forward again in this game. So if you're the type that dislikes this kind of gameplay I suggest you keep browsing. Otherwise many mistakes and different forms of demise await your discovery.